My mom is one of the most creative people I know, not only is she a ceramic artist but she can turn just about anything into something unique and creative. And for as long as I can remember she always finds really pretty ways to wrap gifts for any occasion. 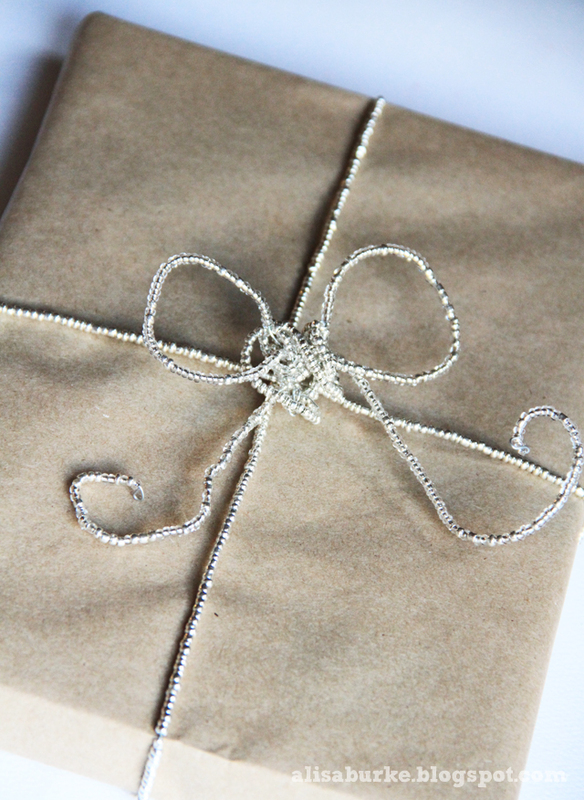 Recently I asked if she would put together a project with some gift wrap inspiration and what she came up with are a few gorgeous ways to use beads in gift wrapping. 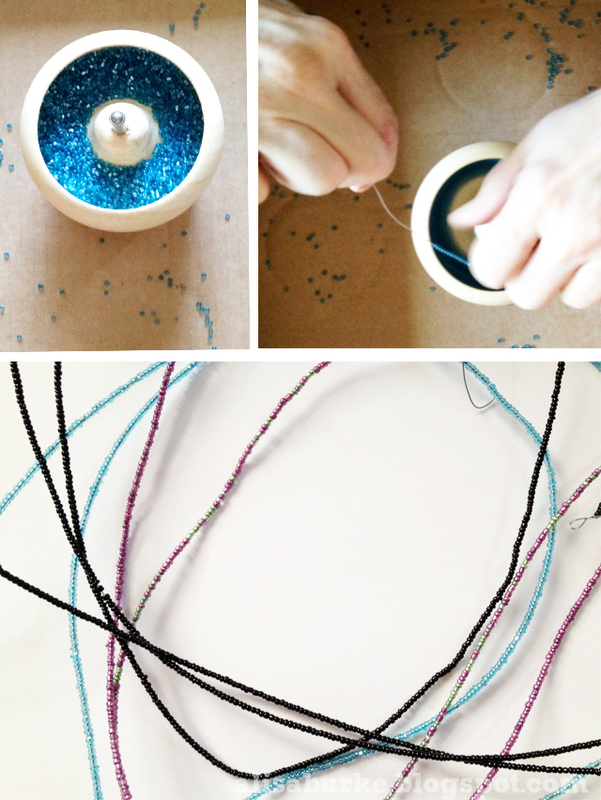 A bead spinner is just about the coolest thing out there (would make a really fun holiday gift too). To use- you fill the spinner with small beads and then spin those beads onto any kind of stringing materials (we used 24 gauge wire). We created a variety of different colors of beaded wire- measuring around 45 inches and then turned those beaded wires into all sorts of pretty little embellishments to top packages! Wrap a package with beaded wire and then bend and twist more beaded wire into a bow. 1. Start by crimping the ends of the wire so the beads won't fall off and then twist the wire into loops. 2. Work your way down the wire, twisting to create more loops. 3. As more loops are created begin bending your wire into a spiral so that the loops overlap and it forms the shape of a flower. 4. 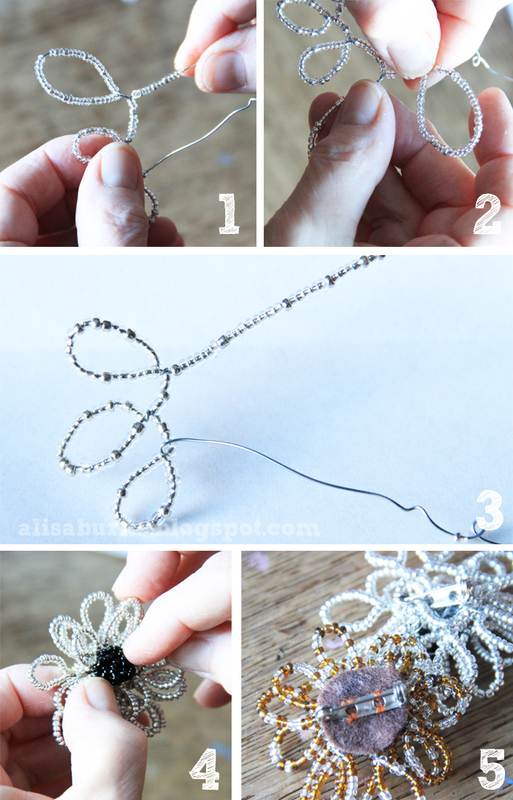 Add a large bead or even more wire beads to the center. 5. 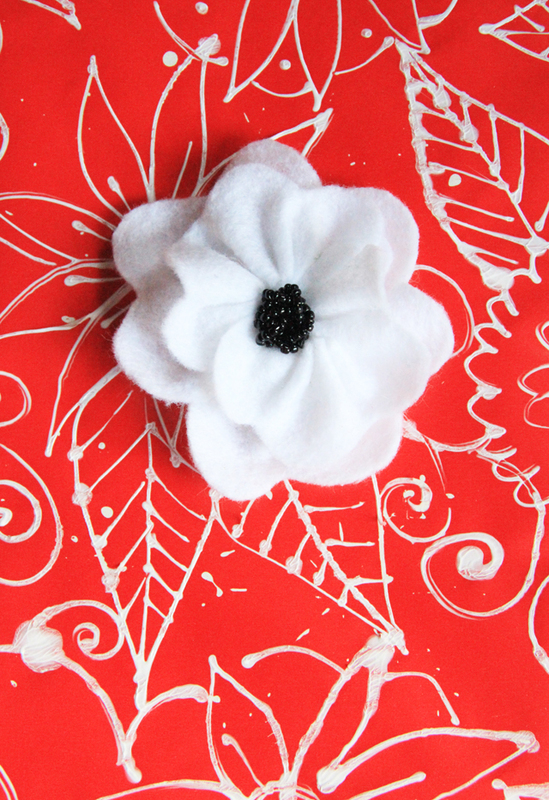 Finish with a pin on the back so that your topper can double as a gift! 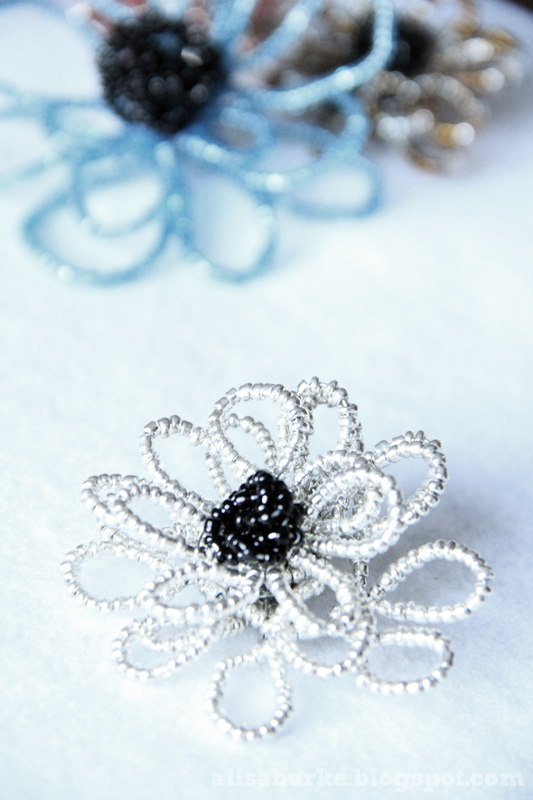 Wire is SO versatile and forgiving - there are all kinds of ways to create flowers and shapes. Use your creativity to bend, twist and manipulate that beaded wire into a variety of sculptural objects! 1. 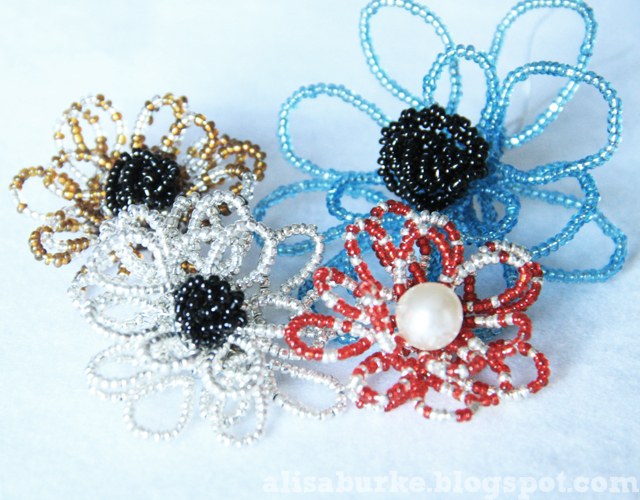 Create the center of a flower by folding beaded wire in half. 2. Then twist it together. 3. Next gather and "scrunch" the wire so that it rolls up into something that resembles a knot! These little embellishments can be used for the center of flowers, can be turned into a pair of earrings or used alone to embellish all kinds of creative projects. 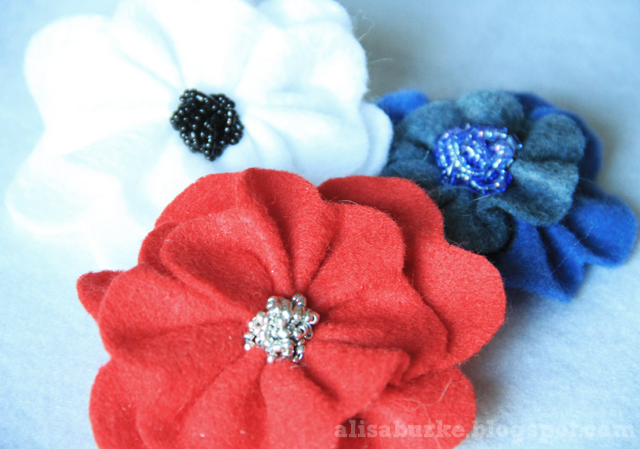 We created simple felt flowers and added tiny beaded knots to the center and added a pin to the back (could also turn then into hair clips). I fell in love with the bead centred felt flowers! I've never heard of a bead spinner before, but now I want one! I love this idea! Please tell your mom that I very much enjoyed this post! 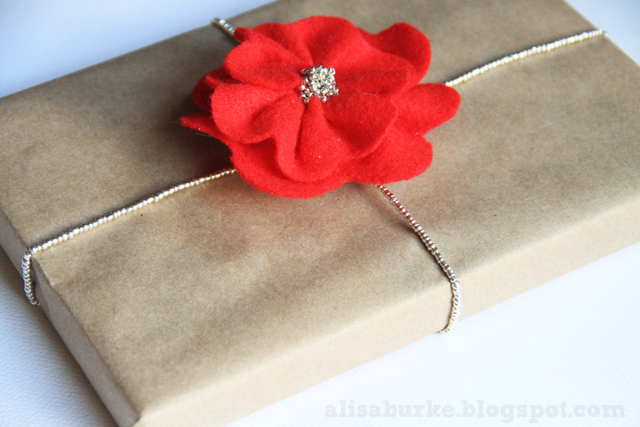 There have been a lot of gift wrapping posts lately, what with the holidays, but this one caught my attention because it is unique, simple and elegant. Wow...who wouldn't love to receive one of these beautifully wrapped gifts. This is so lovely, the wrapping is a gift in itself! I just adore beaded flowers...your mother is more generous than I am to give hers away so freely! I did find a shortcut, though...I pick up little beaded votives in thrift stores for almost nothing and then unwind the long wire strands of beads. It's a good thing to occupy my hands when I'm not feeling particularly creative but I want to play with sparkly, pretty things. 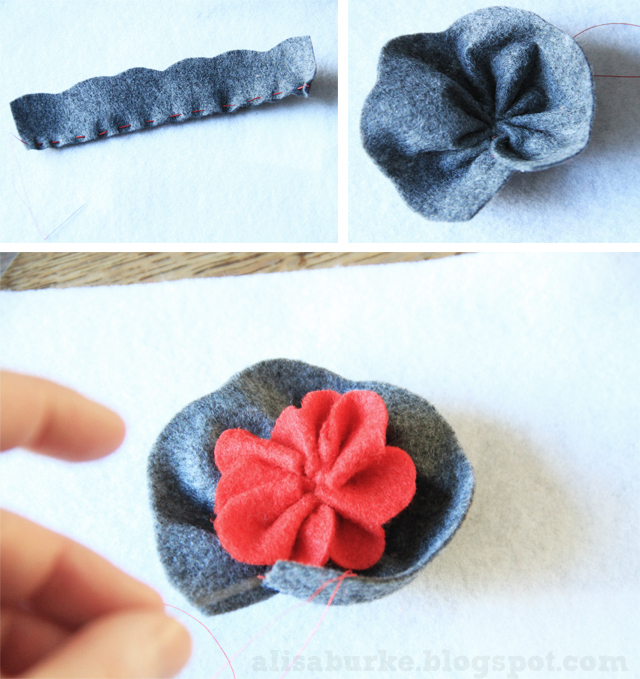 Beautiful - love the felt flower/bead combo! Love that you honour your Mother and her crafty skills! Now you are introducing your wee one to crafting as an important part of life! Fantastic! Imagine receiving one of these gifts around a gift!! awesome post- gotta get that bead spinner! I can see where you get your good looks from now! lol tell your mom thanks for the great post...maybe you should start.."Mondays with my mom" he he he! beautiful creations! must. buy. bead. spinner!! You mom is great! Thank you for sharing this! In Portuguese, LINDA means BEAUTIFUL (Beautiful woman or beautiful girl). You mom has performed great creativity, you are right she is really a great creative person, all the things are looking so beautiful that she has made, and you've taken excellent photographs of this whole procedure and present here as a tutorial. Nice to read this gift idea thanks for sharing this great post. 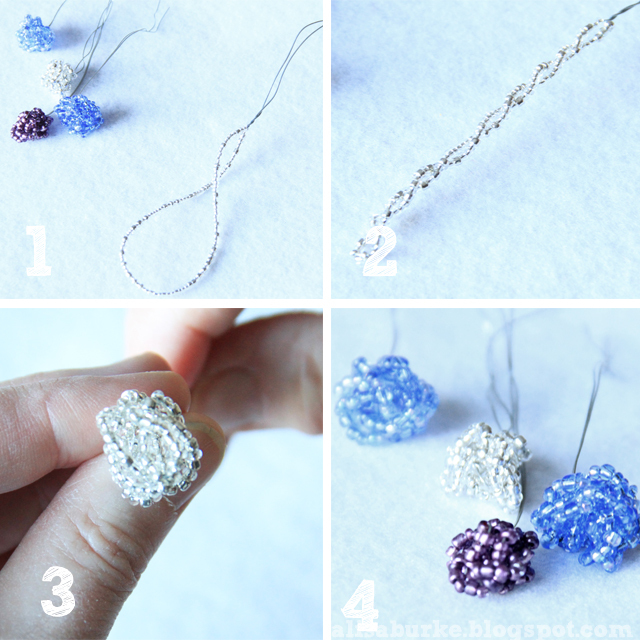 These are such wonderful ideas...the beaded flowers are so pretty! Thank you for sharing the ideas. There are so many people who have GOD gifted talent in which one of you. I have been fan of your site after watching your site. I really like your blog that is so nice and I have a request for you just keep your work continue. Site at Bangalore, Site for sale in Bangalore, Site for sale in Sarjapur Road, Site for sale in Electronic City, Site in Magadi Road, Site at Devanahalli, Bangalore property. I like this Post. Its really nice i like it great job Admin keep it up. for more information visit our link +971563848260.